The question "What is scientific thinking?" often leads to answers about the scientific method or Karl Popper's falsifiability criterion. While both very valid, I would like to propose a new, simpler and more intuitive answer. In Column A, the thinking starts with an observation. You see something, experience something or read about an observation that someone else has made. Then, after the observation, you start reasoning about it, using the laws of logic. After a lot of reasoning, you arrive at a conclusion. Observation: As we expel more carbon dioxide into the atmosphere, the average global temperature rises. Reasoning: It could be explained by the fact that carbon dioxide makes the atmosphere absorb more heat from the sun. Conclusion: When carbon dioxide levels rise, the atmosphere will absorb more heat and temperatures rise. Observation: The increase in temperature is higher than can be explained by the increase in carbon dioxide. Reasoning: As the ice caps melt, less sunlight is reflected back into space, so more sunlight is absorbed by the earth. Conclusion: When temperatures rise as a result of more carbon dioxide, it will lead to side effects that make the temperature rise even faster. What do we see here? As more and more observations are done, existing conclusions are challenged, new reasonings are being performed and new, more detailed and correct conclusions are created. We're on our way to wisdom. Conclusion: Climate change does not exist. Observation: Average global temperatures have been increasing steadily over the last few decades. Reasoning: It is a coincidence. Changes in temperature have happened throughout history. Observation: Average global temperatures have been increasing steadily over the last few decades in a way that is not consistent with random temperature changes throughout history (in other words, the previous reasoning was wrong). Reasoning: The evidence has been forged. It's all a hoax, created by the Chinese to hamper our economy. What happens here? No matter what the observations are, no matter how many flaws are found in the reasoning, the conclusion will never change. Such an unchangeable conclusion is also called a dogma. Of course, Column A is the correct, scientific way to think. But why are there so many people who think according to Column B? To Column A thinkers, the reasonings that the Column B thinkers come up with, often seem very irrational, even absurd. But why can't they see that? The reason is: for them, reasoning has a different purpose! For scientific thinkers, reasoning has the purpose of creating conclusions out of observations. Reasoning, therefore, is very important, since the conclusions are based on it! For Column B thinkers on the other hand, reasoning is not important at all, since nothing follows from it. If the reasonings are absurd or irrational, it does not matter, since nothing depends on the reasonings. This is also why discussions between the two groups are often fruitless. It is as if the groups speak a different language. A Column A person gives a flawless reasoning, proving his or her point, but that reasoning is simply shoved aside by a Column B thinker, because for the Column B thinker, the reasoning is irrelevant if it does not support their predetermined conclusion. For the Column A person, this can be difficult to understand, after all, the Column A person uses reasoning to arrive at conclusions, so if a reasoning leads to a certain conclusion, then the conclusion should not just be dismissed. 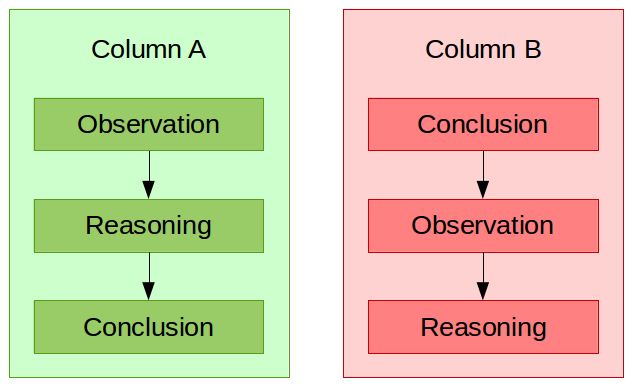 But from the point of view of the Column B person, reasoning has the sole purpose of connecting observations to unchangeable conclusions, so from their point of view, dismissing the reasoning and the conclusion of the Column A person makes sense. Lack of understanding of logic: Since Column A thinkers use reasoning to arrive at a conclusion, they need to be well versed in logical thinking. If you do not understand the laws of logic, then it can be difficult to use the Column A approach. Also, a misunderstanding of logic gives Column B thinkers extra "ammunition" for their reasonings. For example, they could argue: "If climate change cannot be proven, then it must be false". Someone who knows logic, knows that it does not really matter whether something can be (dis-)proven or not. It is very easy to come up with nonsense that cannot be disproven and, similarly, to come up with excellent scientific theories that cannot be proven. If you don't know that though, then you can use false logic to reinforce your Column B reasonings. This reason is, for a large part, due to the fact that logic isn't taught in schools anywhere! Not in primary school and not in secondary school. In most countries, you need to go to university and study something like Computer Science before you're ever exposed to logic. When schools teach "science", they teach scientific facts, for example physics or chemistry. What they don't teach, is a logical, scientific way of thinking. This is a shame, because basic logic is no more difficult than basic math and would greatly increase the reasoning skills of many people. Echo chambers: These are environments (online, or in the real world) where people are surrounded by other people who share the exact same opinions. No opinion is ever challenged and the people continuously reaffirm the opinions of one another. Echo chambers are often rife with Column B type thinking, but the problem is: even when a Column B reasoning is wrong, how would you know if everyone around you agrees with it? The Internet does make it easier for people to meet other people with different opinions, but at the same time, the Internet also creates a lot of echo chambers of its own. Conservatism: A lot of people like the idea that things are the way they are, do not change and will always be the same. This is especially true when it comes to changes that are too slow to notice in a lifetime, such as evolution, plate tectonics, astronomical changes and, to a lesser degree, climate change. Confirmation bias: Column B type people tend to only register observations that confirm their conclusions, while discarding or ignoring observations that do not confirm their conclusions. By doing that, they constantly reinforce their feeling that their conclusions are correct. Sensationalist, click-bait media: This is something that has surfaced very recently: websites on the Internet that are exploiting the weaknesses of the human psychology. They create articles with headlines that trigger curiosity and the desire to click on it, only to then lead the reader to articles full of sensationalist content, triggering even stronger reactions, such as anger and hatred. Eventually, readers end up addicted to content that keeps triggering these reactions in the brain, reaffirming the content that has been presented earlier. Once hooked, readers will move to a Column B type of thinking, rejecting any views that contradict the content which keeps their brains happy with a daily dose of anger and sensation. Take a look at this excellent video to find out more about this. Apart from these, there are quite a few more human psychological traits that affect rational thinking. Young earth creationists, who believe that the earth is only a few thousand years old and was created exactly like it is today. Anti vaxxers, who believe that vaccines cause autism and refuse to vaccinate their children. Created by the aforementioned click-bait media and grown strong through Internet echo chambers, this is a particularly dangerous group of people, since they're actively bringing back diseases that were almost eradicated. Geocentrists / Flat earth truthers, who believe that the earth is flat and at the center of the universe. Yes, they really do exist. An interesting question is: does religion belong in this list too? My answer would be: not necessarily. While it is true that a lot of religious people practice Column B type thinking, it is also possible to be religious, while still maintaining a scientific, Column A mindset. So, what must a religious person do in order to be safe and sound in Column A? But what if you are certain? What if you can't help yourself? What if you have this realization, deep down, that you're certain that your god exists? Well, let's assume for a moment that you're a christian and you are certain that the christian god exists. In that case, you will also deny the existence of other gods, for example the hindu gods. Your christian god exists and the hindu gods do not and you are certain of it, for whatever reason. Now, imagine a hindu, and realize that he has the exact same certainty that you have! To him, the christian god is false, the hindu gods are real, he is just as convinced and certain as you are and... he's wrong. His gods don't exist, right? So what does that prove? It proves that being certain is not enough to be certain. After all, he is as certain as you, and he's wrong. And if you say: "well, that means that he cannot be as certain as me", then you've just created a reasoning that ties an observation to an unchangeable conclusion. Welcome to Column B! It does take great maturity to understand that the opinion we are arguing for is merely the hypothesis we favor, necessarily imperfect, probably transitory, which only very limited minds can declare to be a certainty or a truth. Always make sure that you let your observations and subsequent reasonings determine your conclusions. This also means that you cannot deny certain scientific certainties, such as evolution and the history of the universe. Those theories have been formed through sound observation and reasoning, so denying them automatically leads to Column B. Of course, from a theoretical point of view, those scientific theories cannot be proven beyond any theoretical doubt, but if every single observation confirms a theory, then for all intents and purposes it should be regarded as a correct theory. Realize that there is no "proof" that proves your religion correct. Sure, there are plenty of such "proofs" available online, but once you develop an understanding of logic and science, you will quickly discover that all of them are false. Instead of believing in your religion because of some "proof", realize that there is no proof, you cannot be certain, but you can still believe, simply because you want to and it makes your life better. This could potentially make your belief stronger as well, because if you believe for the wrong reasons (for example, "god cannot be disproven, therefore he must exist", which is logically incorrect, because seven little midgets on the far side of Jupiter can not be disproven, either), and at some point you realize that your reasons are false, the basis for your religion could disappear. If instead you believe because you want to and it makes your life better, while at the same time acknowledging science and realizing that there's no such thing as certainty, then there is no basis that could disappear. I don't believe in any god myself, however, there are things that I do believe in, despite the fact that I can never be 100% certain. I believe, for example, that my family is real, even though in theory, everything around me could be a simulation and I could be a test subject in some experiment. This does seem far fetched, but from a theoretical point of view, it is a possibility. The important thing is that, even though I believe something that I cannot prove, I am well aware of the fact that I might be wrong and I do not believe anything that contradicts science. Popper's criterion is not easy to understand. In fact, to people who aren't skilled in logic, a theory that is not falsifiable might actually be interpreted as a very strong theory. After all, if it cannot be falsified, then it must be true, right? 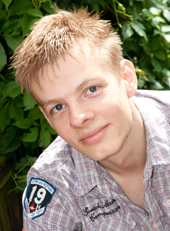 The Column method on the other hand, is simple and intuitive, even for people without training in logic. Popper's criterion automatically follows from the Column method! After all, a theory that was constructed using Column A (and therefore scientific), is automatically falsifiable, because a change in observation or reasoning can change the conclusion. Conversely, a theory that was constructed using Column B (and therefore unscientific), is automatically unfalsifiable, since the conclusion is fixed. So, when you use the Column method, you get Popper's criterion for free! So to conclude, I would like to ask everyone to promote this method of distinguishing science from anti-science. It's easier to understand and more likely to make people think about how their minds work. If you have any additions or comments, please don't hesitate to post them below!